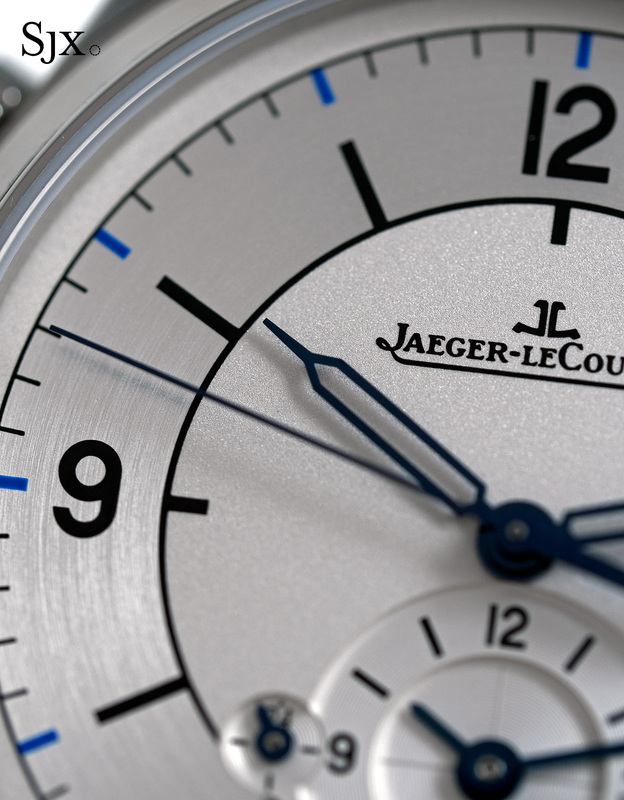 Varied round wristwatches with simple complications from Jaeger-LeCoultre. 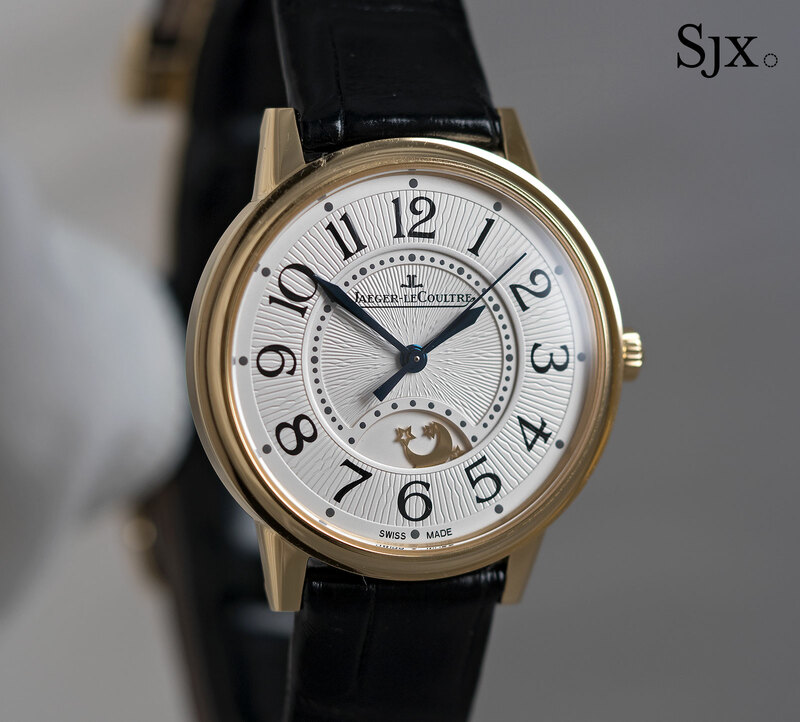 For the first time in several years Jaeger-LeCoultre‘s line-up at SIHH 2017 was not dominated by the Reverso, instead being heavy on relatively affordable round watches with simple complications. The popular vote the fair went to the trio of Master Control watches with retro “sector” dials. Also known as “scientific” dials, such dials with segments for easier time measurement were mostly made in the 1940s to 1950s, but have recently become popular in vintage watch collecting. 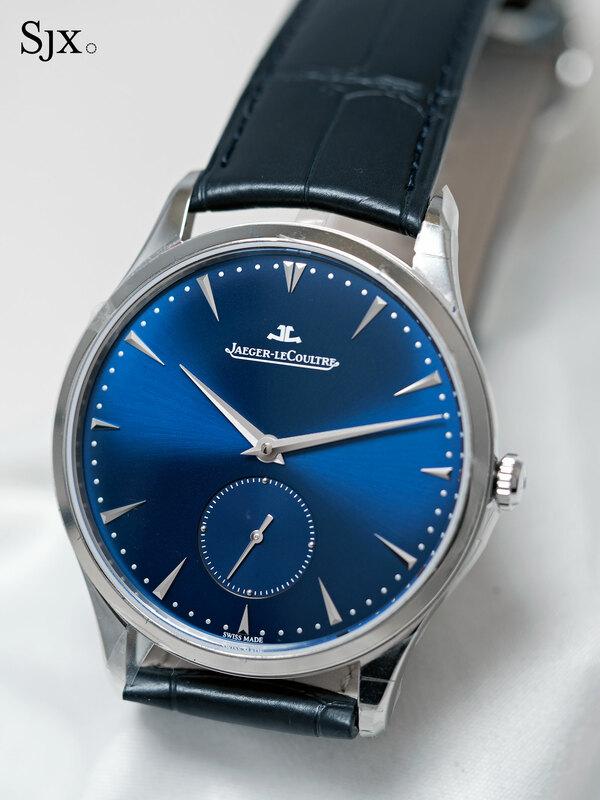 That has spilled over into modern timepieces and Jaeger-LeCoultre is the latest to join the bandwagon. 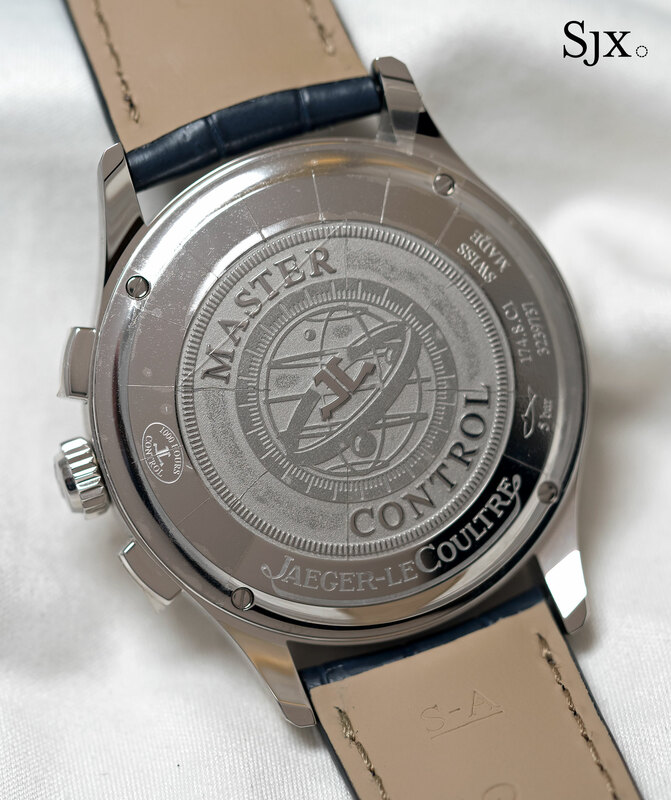 Although such watches are not historically associated with Jaeger-LeCoultre, not even with a lot of imagination and research, the Master Control “sector” dials are good looking timepieces. 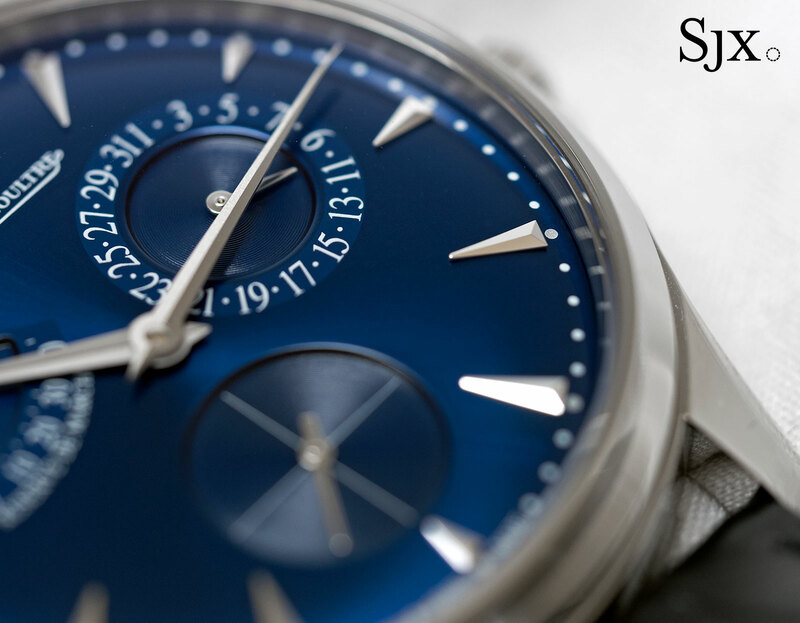 All share two-tone silver dials with pale blue accents – even the date numerals are blue – matched with skeletonised pencil-shaped hands. Appealingly simple but distinctive, the dials are nonetheless simply constructed, with all of the markings being printed, possibly explaining why these cost about 10% less than comparable Master models with applied markers on the dial. The base model is the Master Control Date (ref. 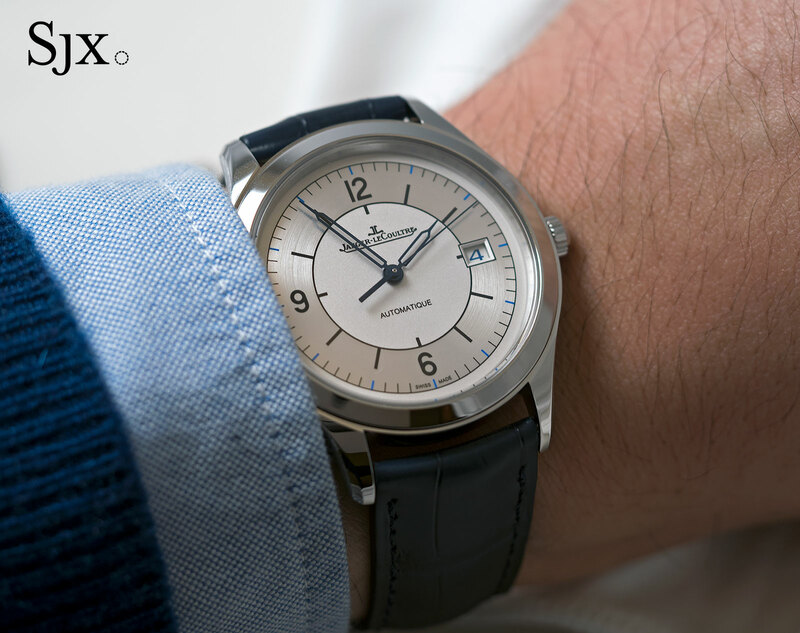 1548530), a 39mm automatic in a slim, 8.5mm high steel case. 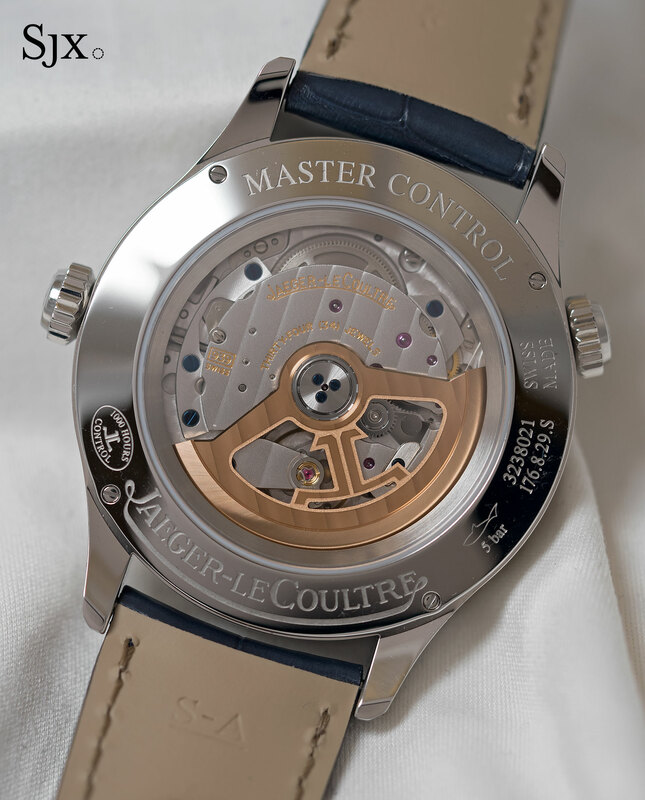 It’s powered by the calibre 899, the brand’s basic self-winding movement with a shortish 38-hour power reserve. This costs €5900 or S$8800. 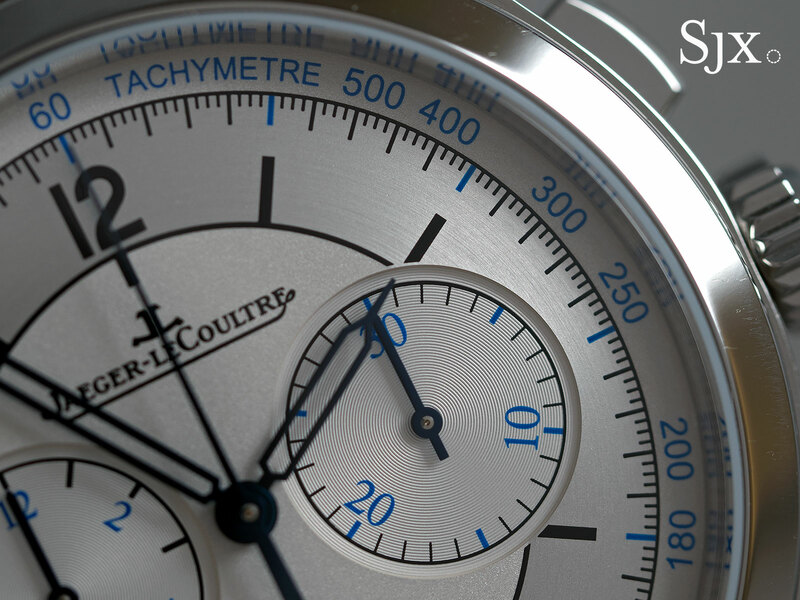 The Master Control Chronograph (ref. 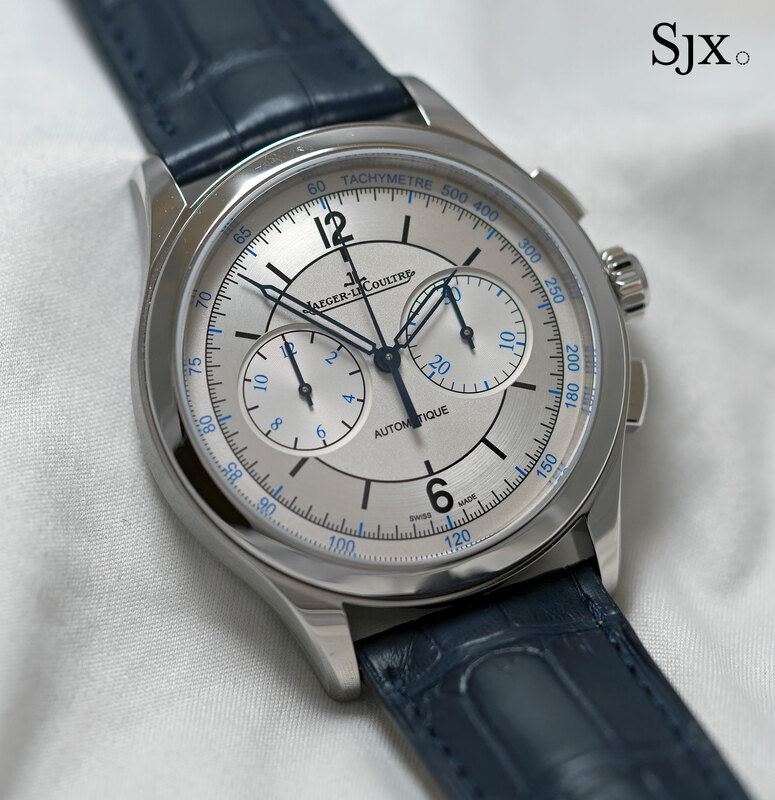 1538530) also passes well for a vintage watch, being 40mm in diameter and 12.1mm high. Admirably it has no date window, preserving the retro feel. This has the calibre 751G inside, an automatic movement with all the features expected of a mid- to high-end chronograph calibre, namely a column wheel and vertical clutch. It costs €8300 or S$12,400. The last of the three is the Master Control Geographic (ref. 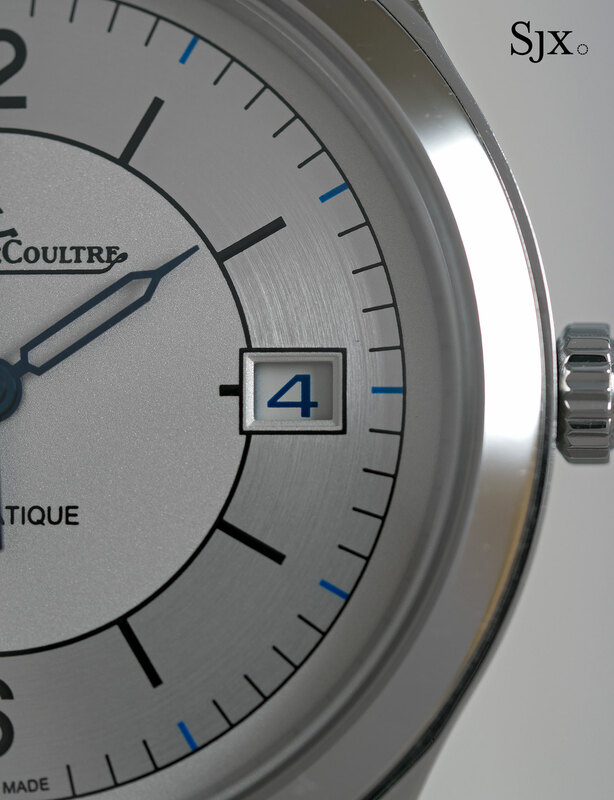 1428530), a dual time zone with world time that looks the most modern of the three. 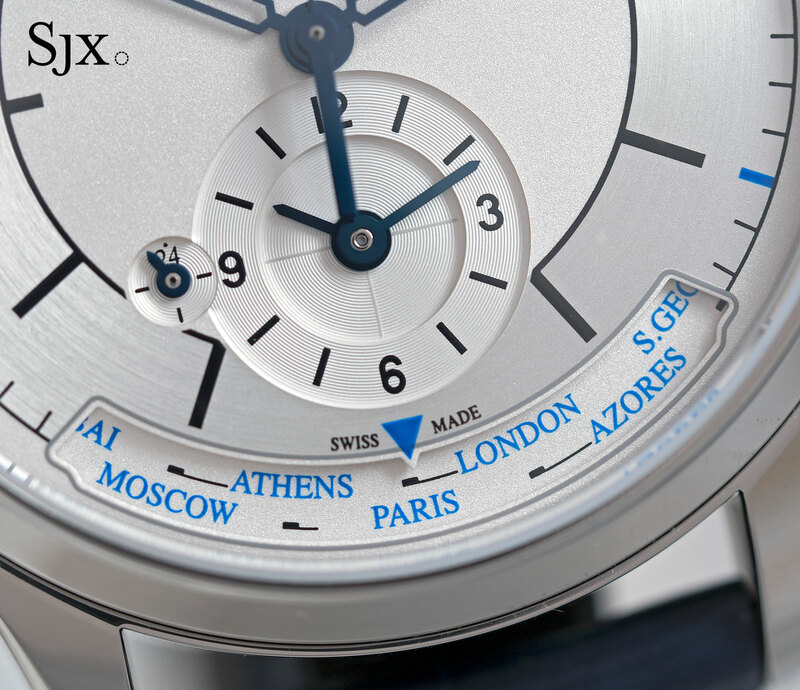 The dial layout gives it a contemporary feel, but it is functional, with the second time zone at six o’clock and the cities disc just below. 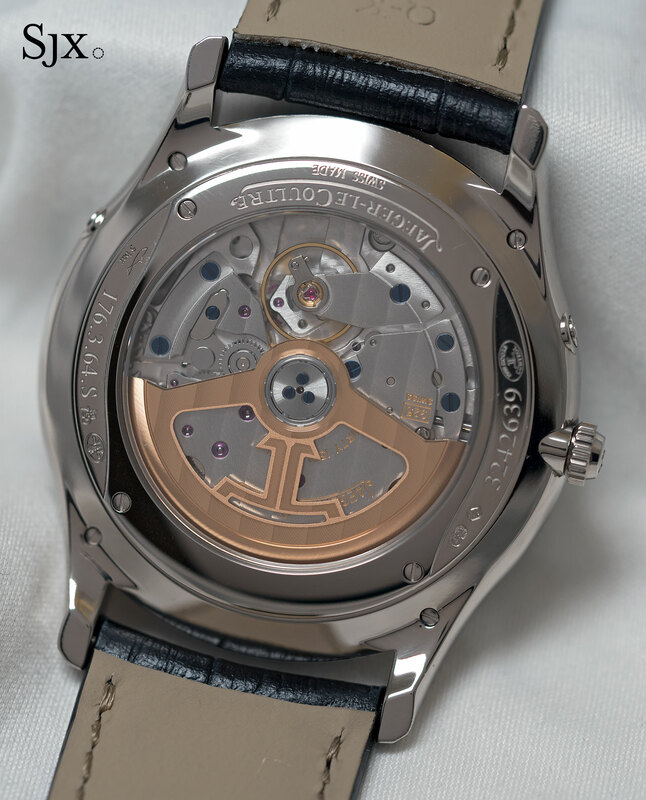 The crown at 11 o’clock sets the second time zone, while the movement inside is the automatic calibre 939B/1. This costs €9800 or S$14,600. 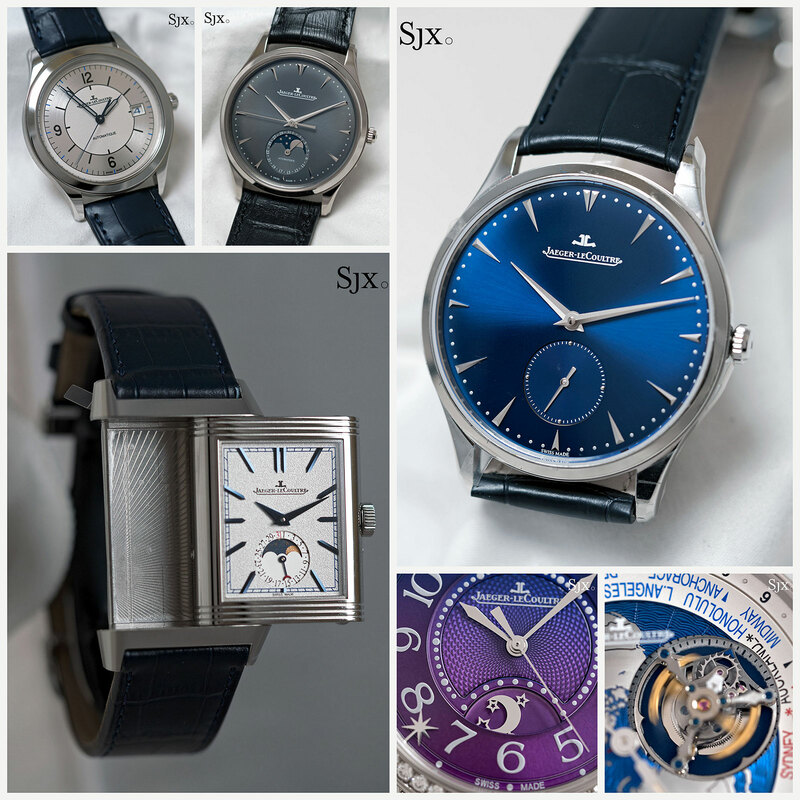 Part of the same collection but more modern looking are the new Master Ultra Thin watches. 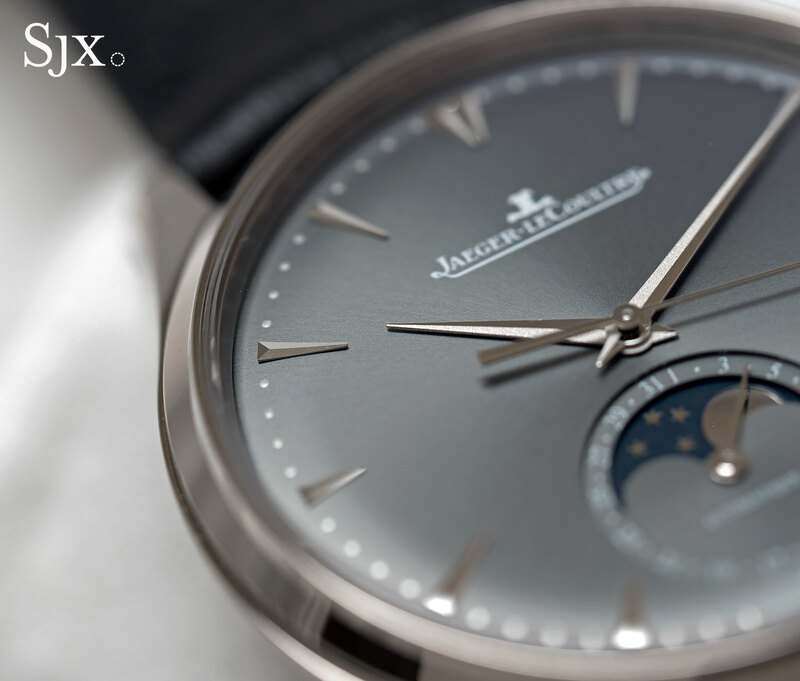 The Master Ultra Thin Moon (ref. 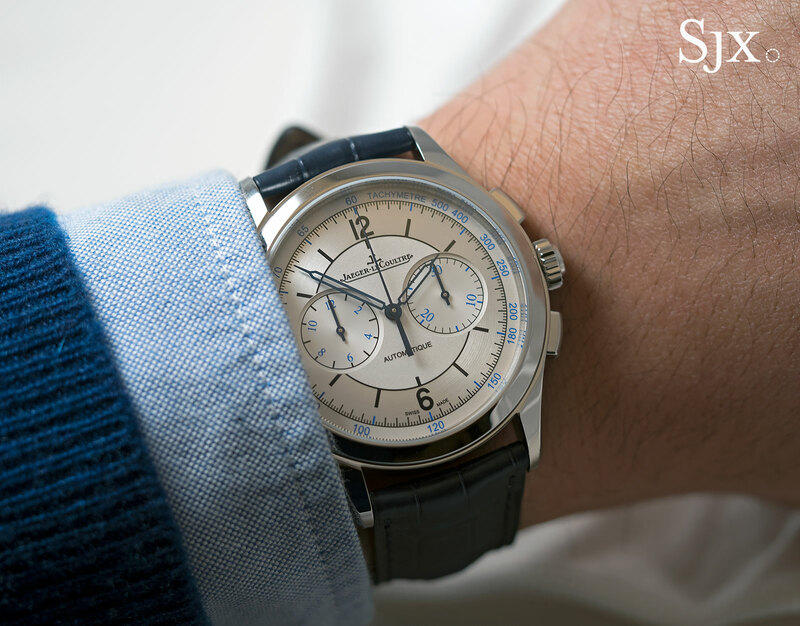 1363540) is now available in white gold with a dark grey dial. While not novel it is a good look, with the case being 39mm in diameter. The centre second hand and date pointer at six o’clock look incongruous together though. This is priced at €19,400. 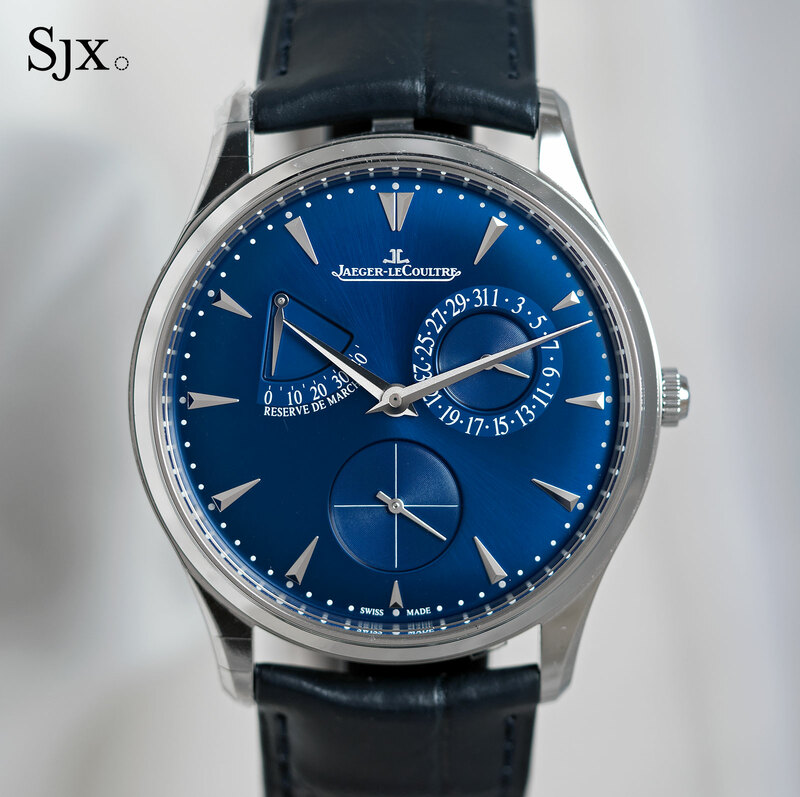 More striking is the Master Ultra Thin Reserve de Marche (ref. 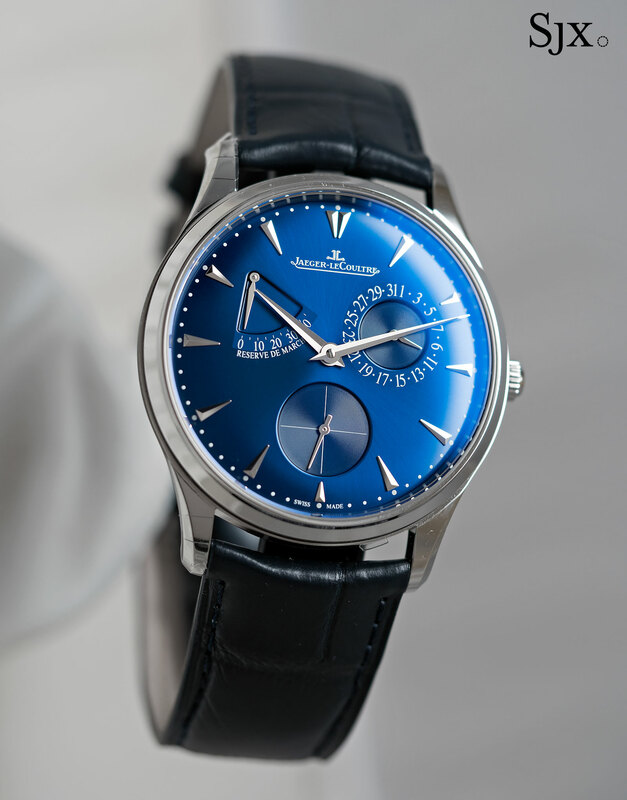 1378480) in stainless steel with a rich blue dial. 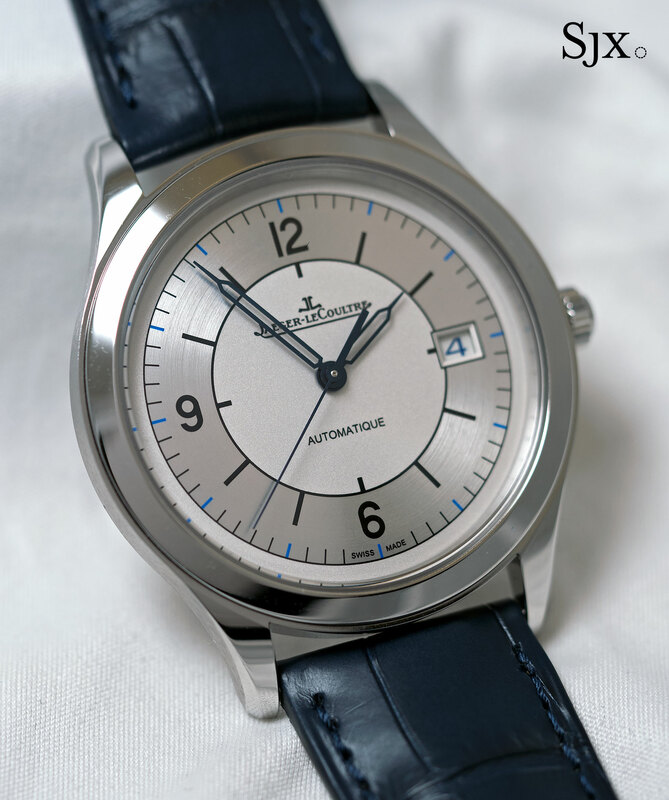 Also 39mm in diameter, this has three useful indications on sub-dials, and a blue dial with a thin layer of varnish that gives it a good gloss. 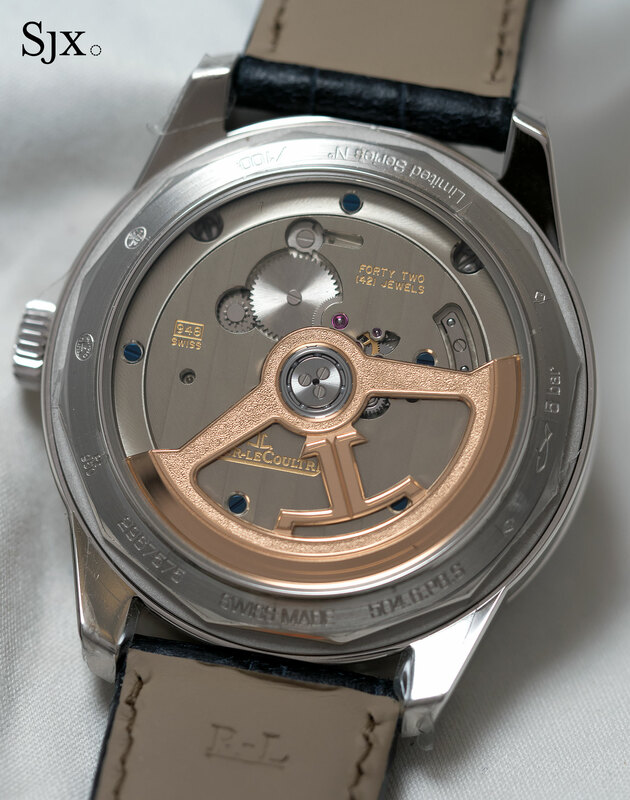 The movement inside is the automatic calibre 938/1. It costs €8650 or S$13,000. 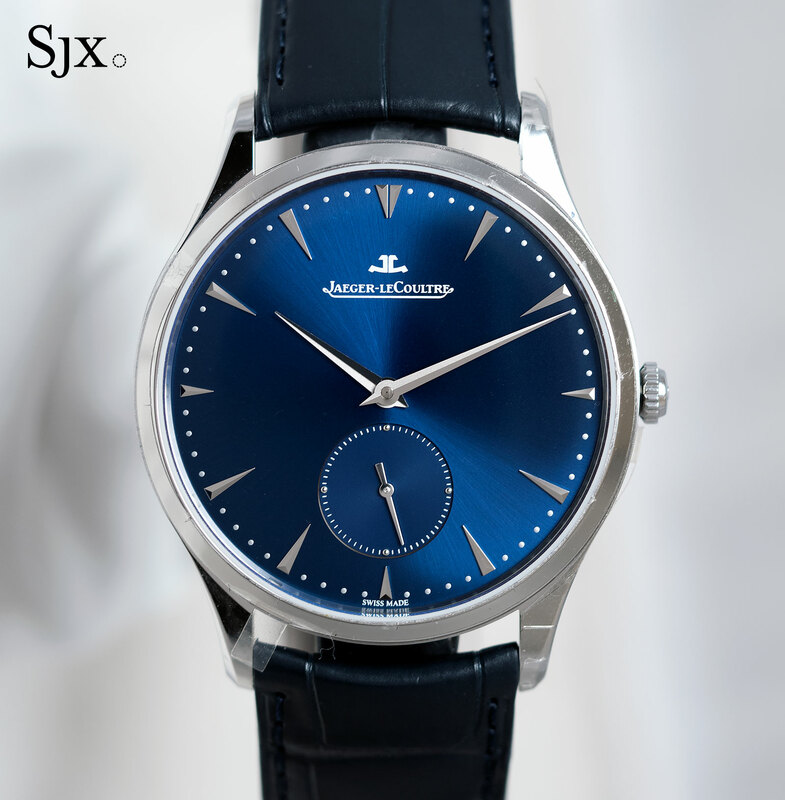 Furnished with a blue dial in the same colour is the Master Ultra Thin Small Second (ref. 1358480) in steel. Slightly larger at 40mm in diameter, this is a slim 7.6mm high with the calibre 896 inside. It costs €7350 or S$11,000. The last addition to the Master line is a sports watch, the Master Compressor Chronograph in ceramic with pink gold accents. 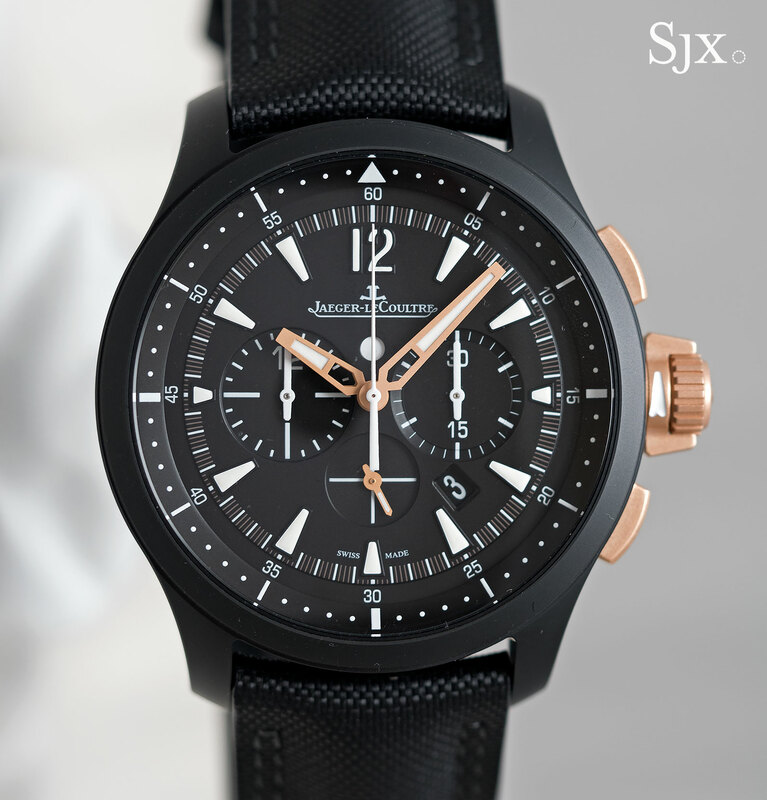 This 46mm sports chronograph was already available in ceramic with the pushers and crown in steel; the pink gold additions are new. 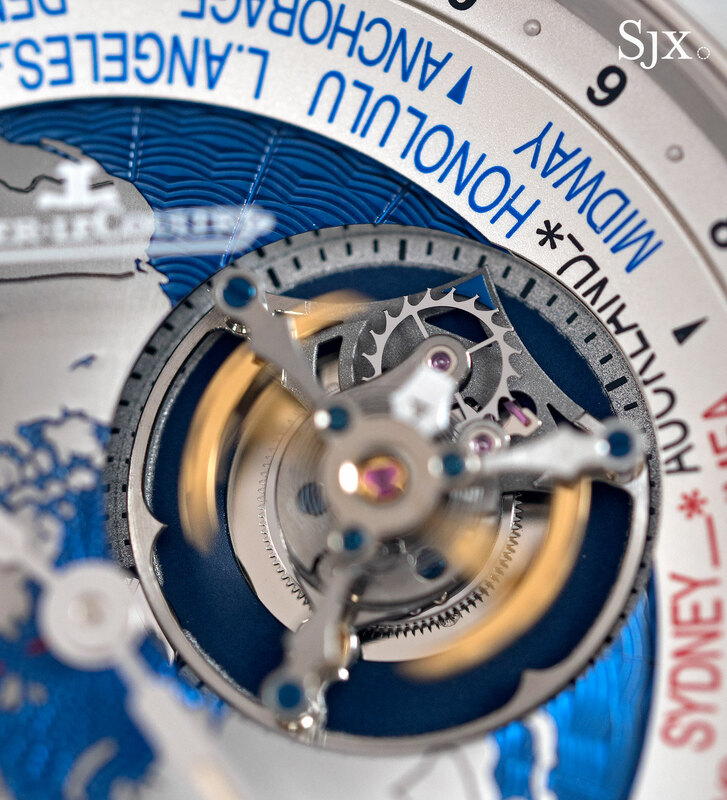 One of the most complicated watches unveiled at the fair was the Geophysic Tourbillon Universal Time (ref. 8126420). 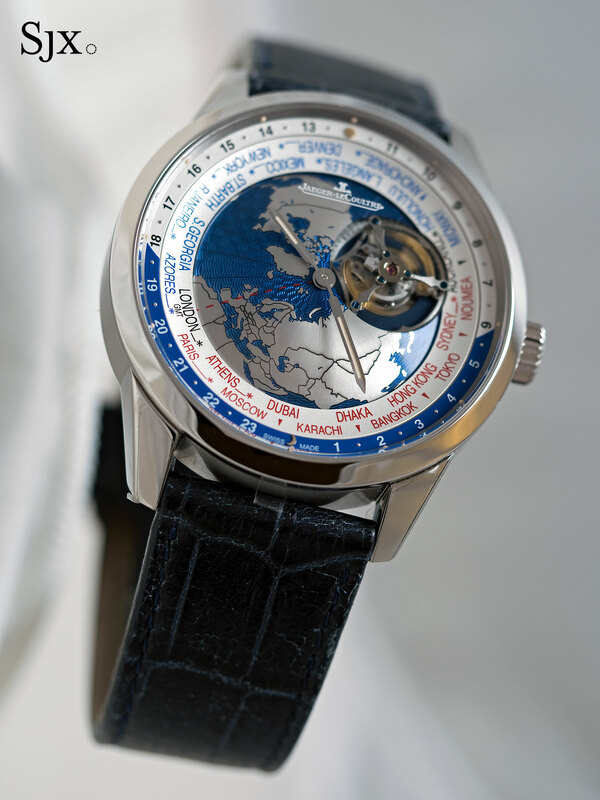 This has a domed-shaped dial in blue lacquer featuring a world map as well as a one-minute tourbillon on one edge, two complications that might be interesting separately but less so together. The tourbillon carriage makes one revolution a second, but the dial itself goes round every 24 hours, making it an orbital tourbillon as well. 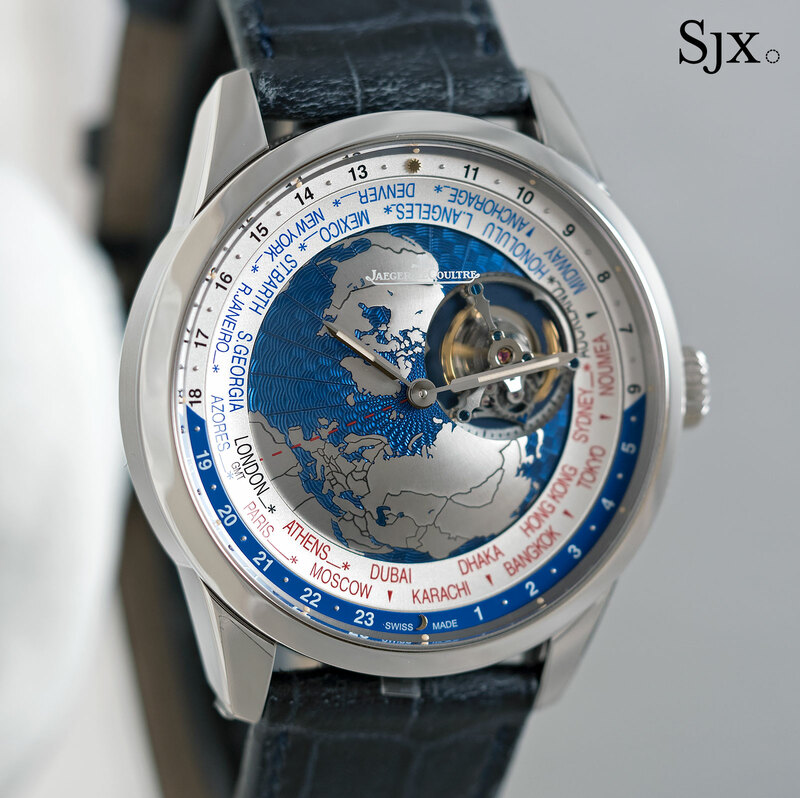 Like conventional world time watches, this shows the 24 time zones in the world, and can be set in one hour steps. 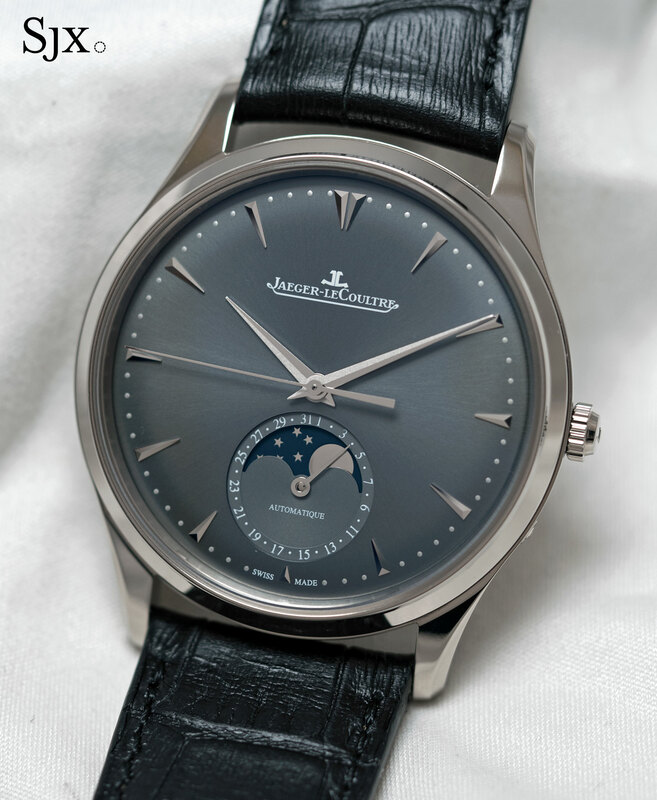 The case is platinum and 43.5mm in diameter, making it large and hefty. 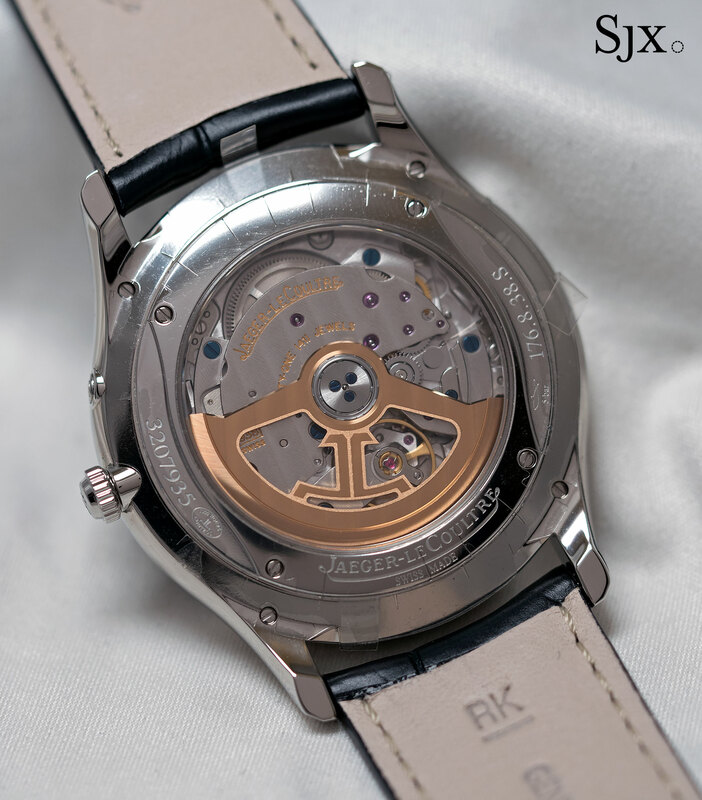 A see-through back reveals the calibre 948, an automatic movement with an attractive cast solid gold rotor. The rest of the movement, however, is plain, with a large bridge that covers most of it. The Geophysic Tourbillon Universal Time is a limited edition of 100 watches priced at €130,000. The other addition to the Geophysic range is a new bracelet, available for both the Geophysic True Second and Geophysic Universal Time. Solidly built and five links wide, the bracelet’s key feature is a quick-release lever on the inside near the lug. 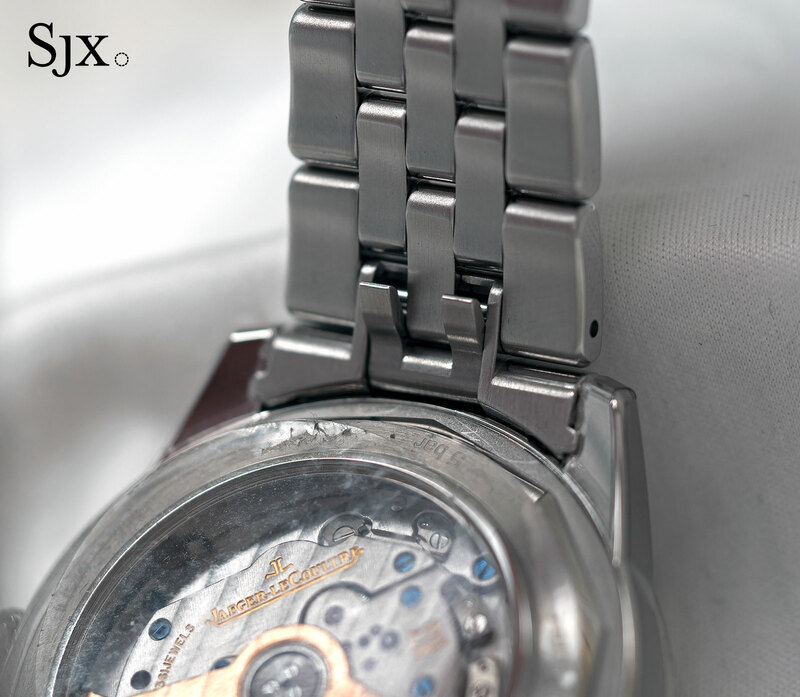 Lifting the lever retracts the tips of the spring bars, allowing the bracelet to be quickly removed. A strap (assuming it has quick-release spring bars as well), can then be swiftly attached. The bracelet is an extra €1700 or so. So the Geophysic True Second on bracelet (ref. 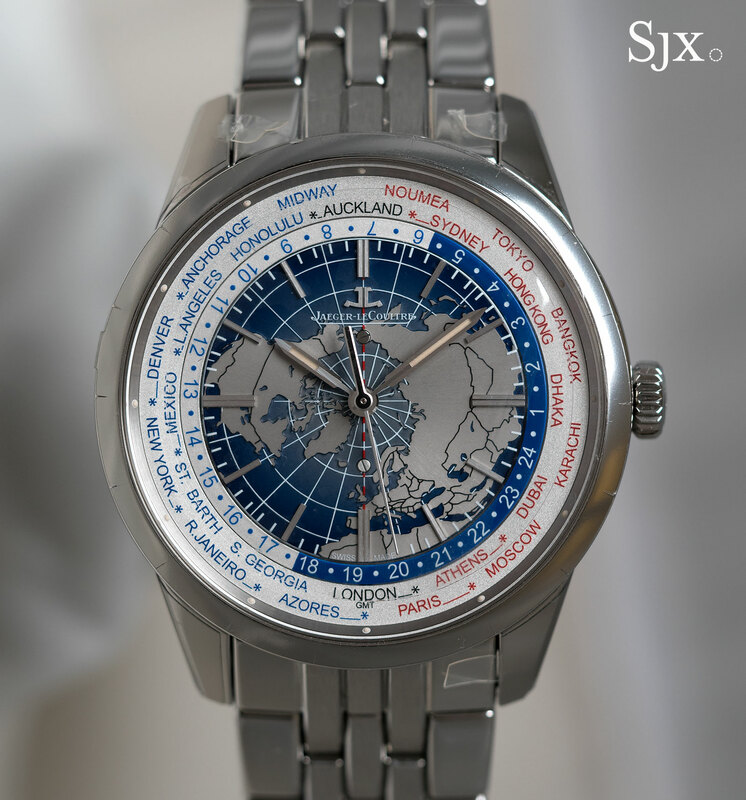 8018120) costs €10,800 or S$16,000, while the Geophysic Universal Time on the same (ref. 8108120) is €16,100 or S$23,500. The 2017 line-up also encompasses round ladies’ watches, namely variants of the Rendez-Vous. 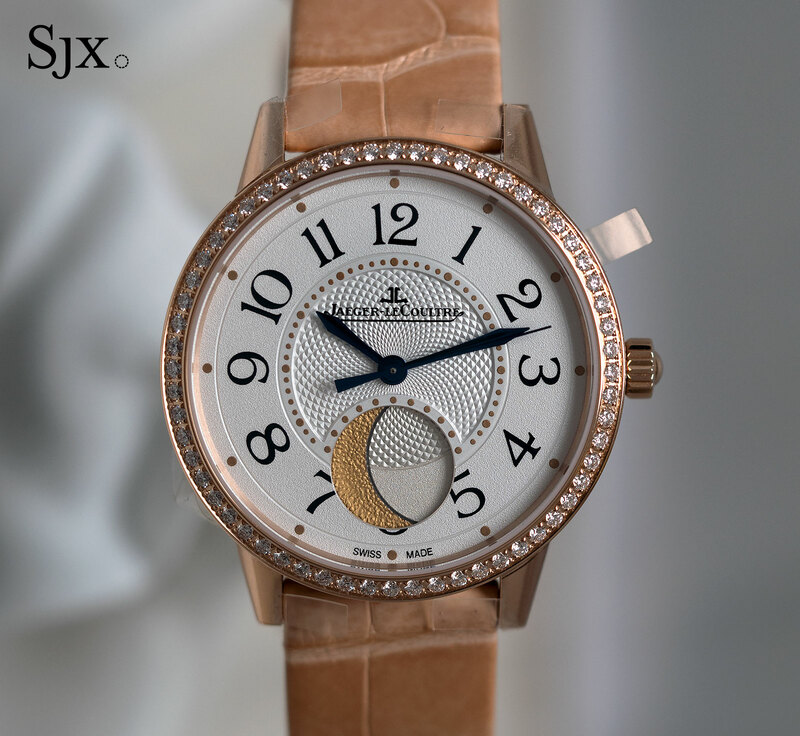 The Rendez-Vous Sonatina features a reminder function, with a small star on the dial that sets a striking mechanism which sounds a single chime on the appointed hour. At six o’clock a night and day indicator sits inside a small aperture. This is 38.5mm in diameter and available in pink or white gold. 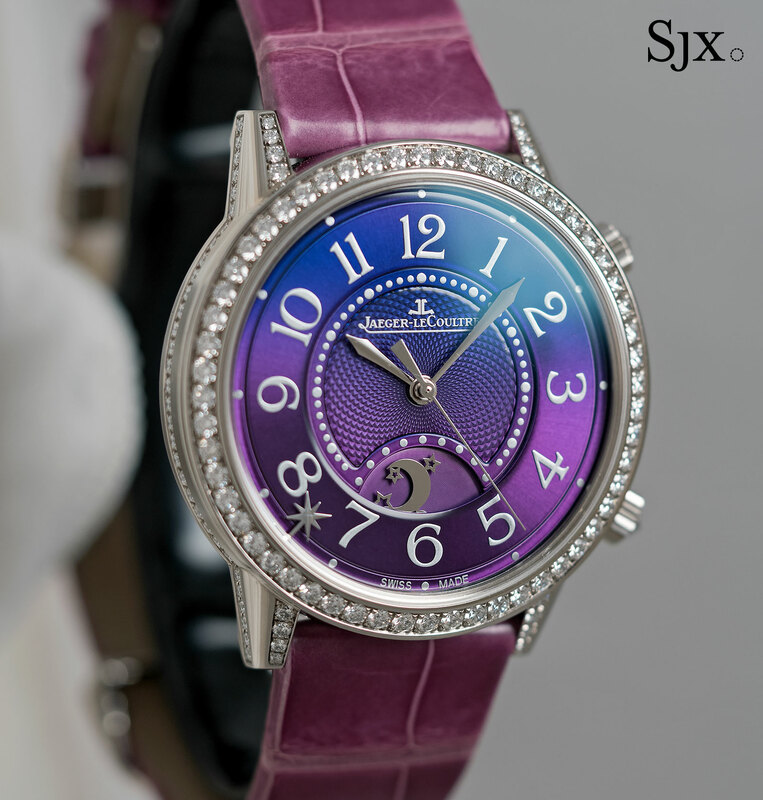 While the pink gold is sedately colour, the white gold model features a grained, amethyst dial. 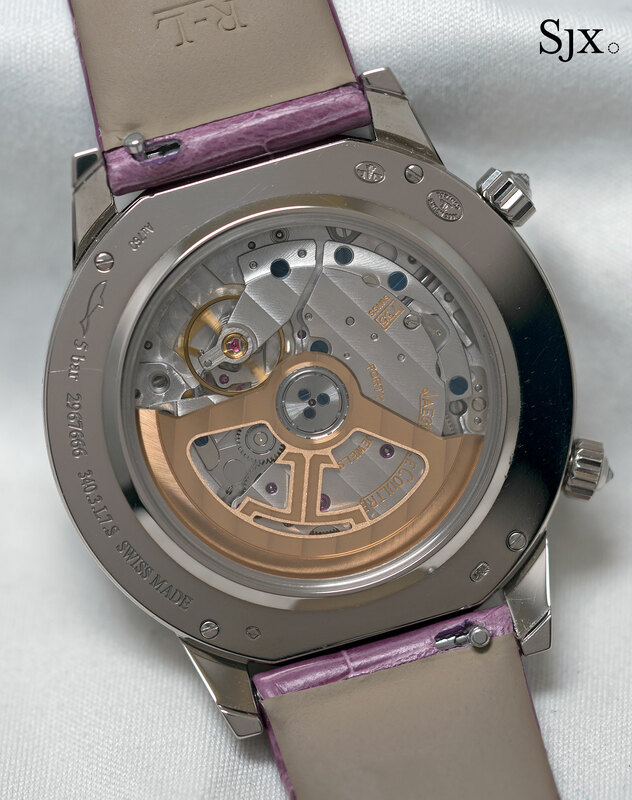 Inside is the self-winding calibre 735, a relatively thick movement due to the addition of the alarm function. 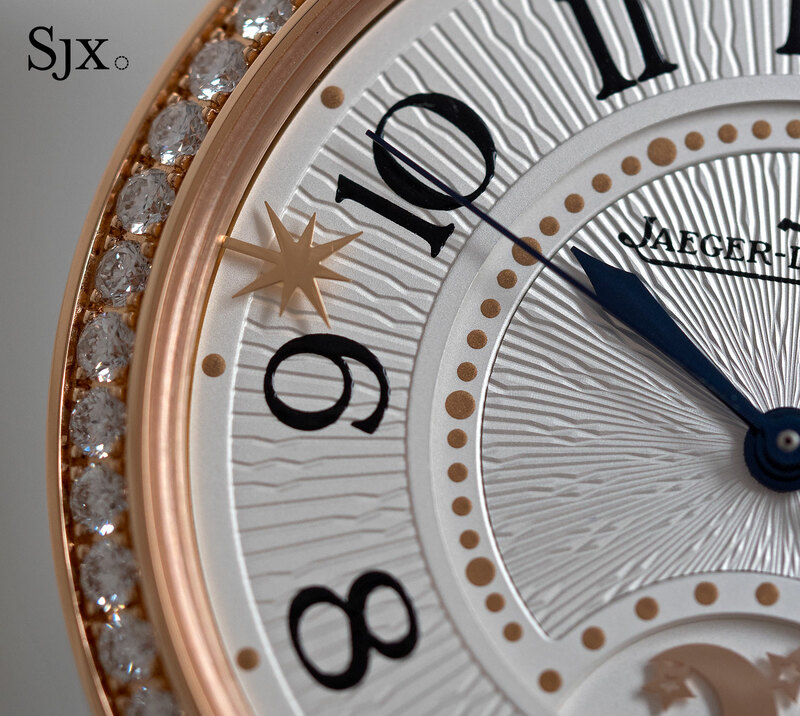 This means the case is 10.59mm high, substantial for a delicate ladies’ watch. This costs S$59,500 in white gold (ref. 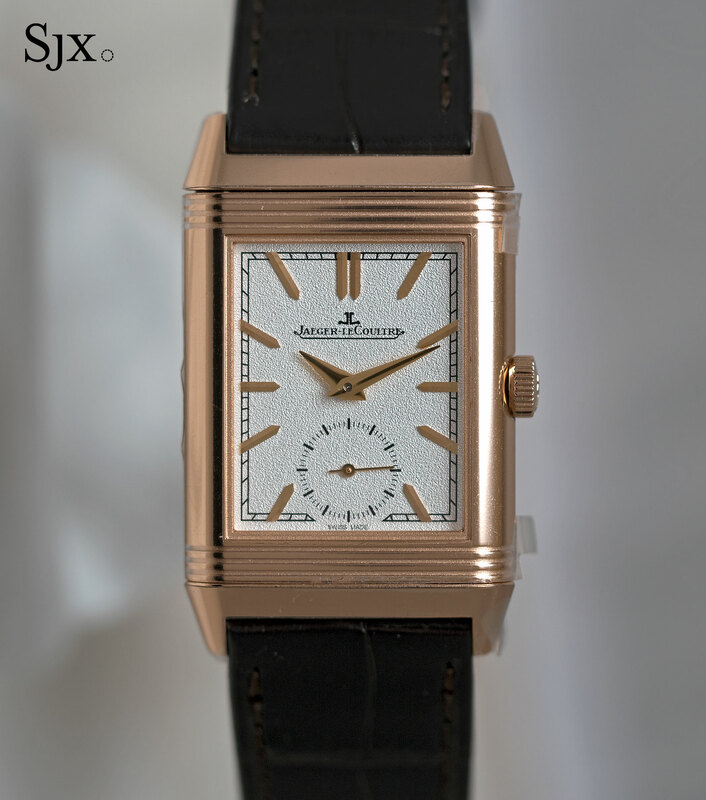 Q3593480) and S$42,500 or S$29,100 in pink gold (ref. 3592420). 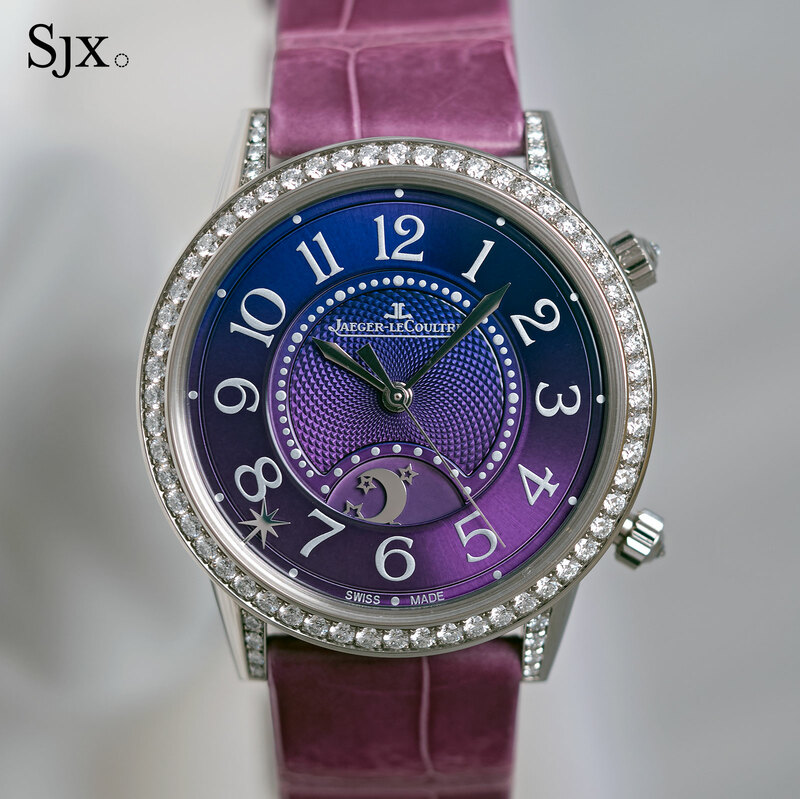 The Rendez-Vous Night & Day is available either in large (38.2mm) or medium (34mm) sizes. Both have identical functions, with a night and day indicator at six o’clock. Notably, while the large model is available in steel or pink gold, the medium version is only available in less common yellow gold (ref. 3441420). 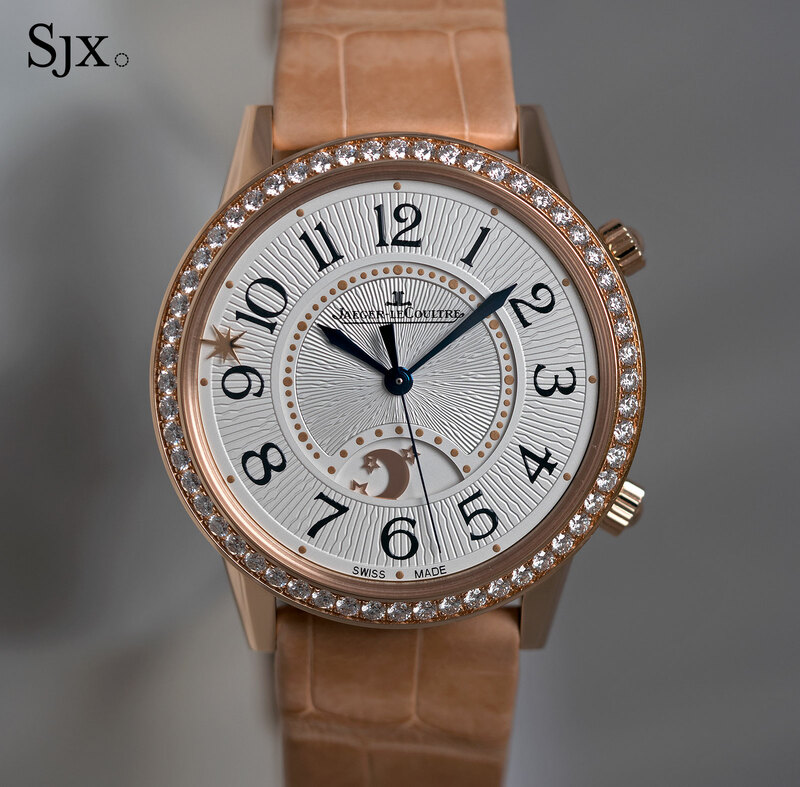 The Rendez-Vous Night & Day Large in steel starts at €9150, while the pink gold with diamonds is €23,500. 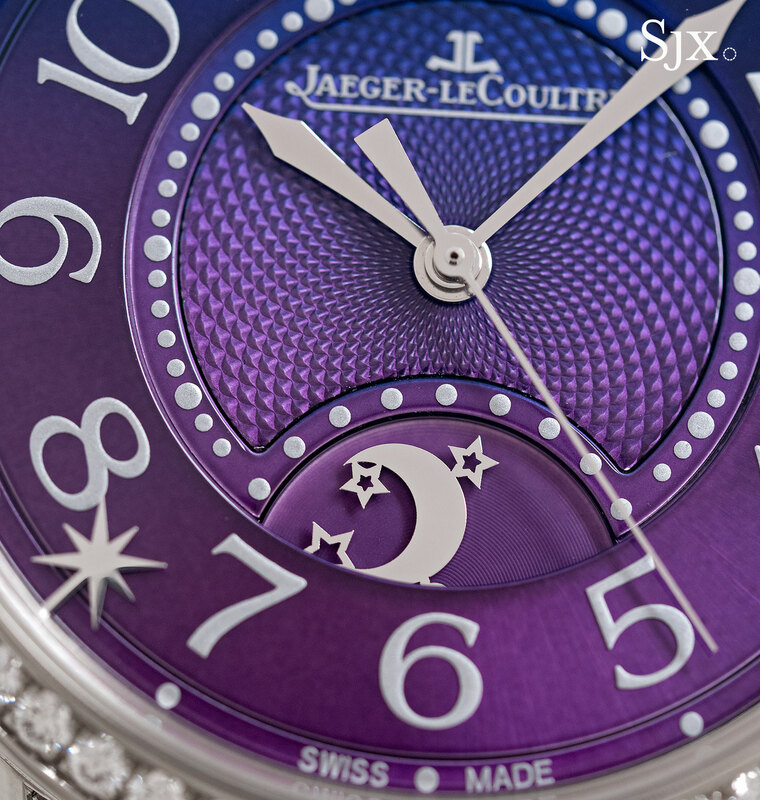 Visually similar is the Rendez-Vous Moon, available in the ordinary 36mm size or as the 34mm Rendez-Vous Moon Medium. This has a large moon phase display at six o’clock. 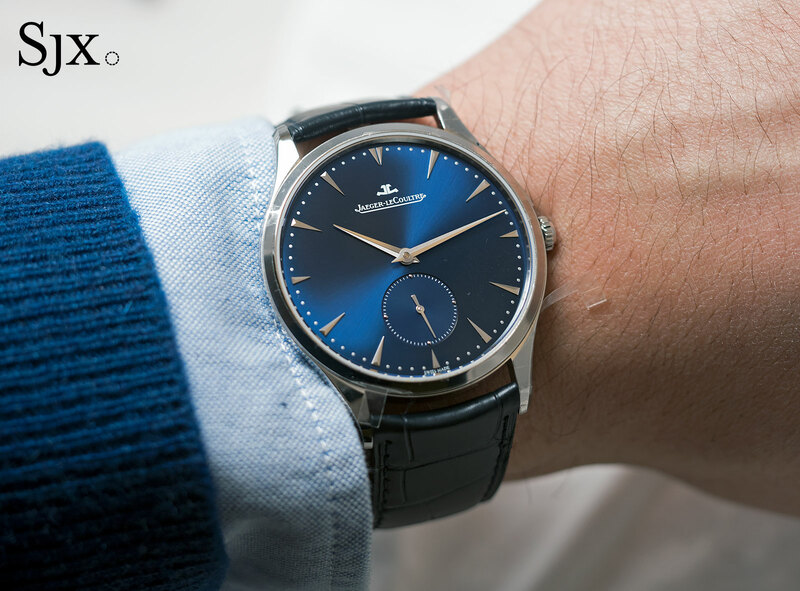 This starts at €15,300 or S$23,500 in steel with a diamond bezel. 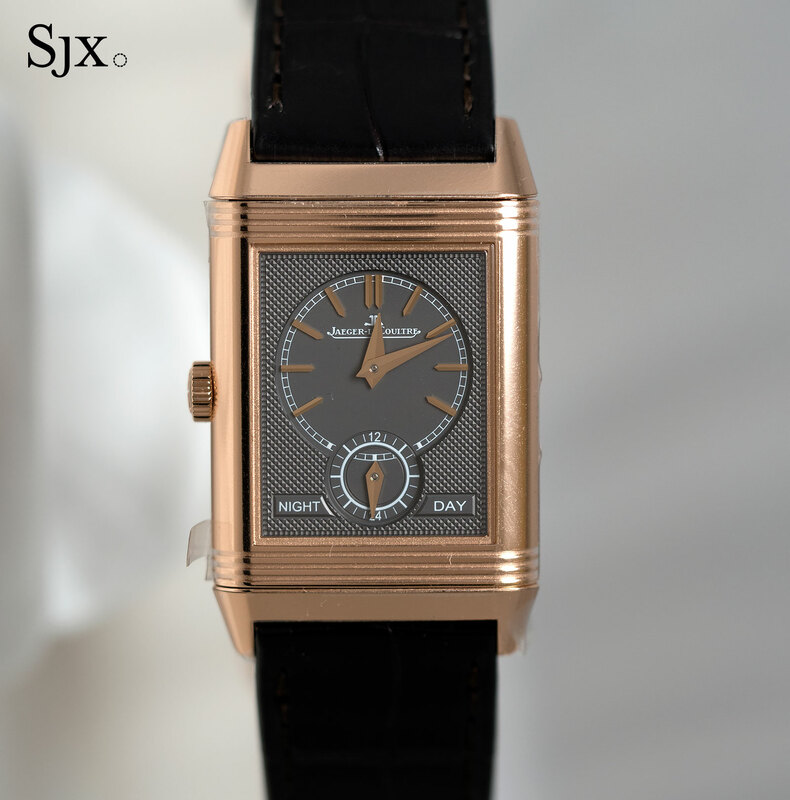 The Reverso highlights from the 2017 line-up both continue the Reverso Tribute aesthetic characterised by dauphine hands and a grained dial introduced in 2016. 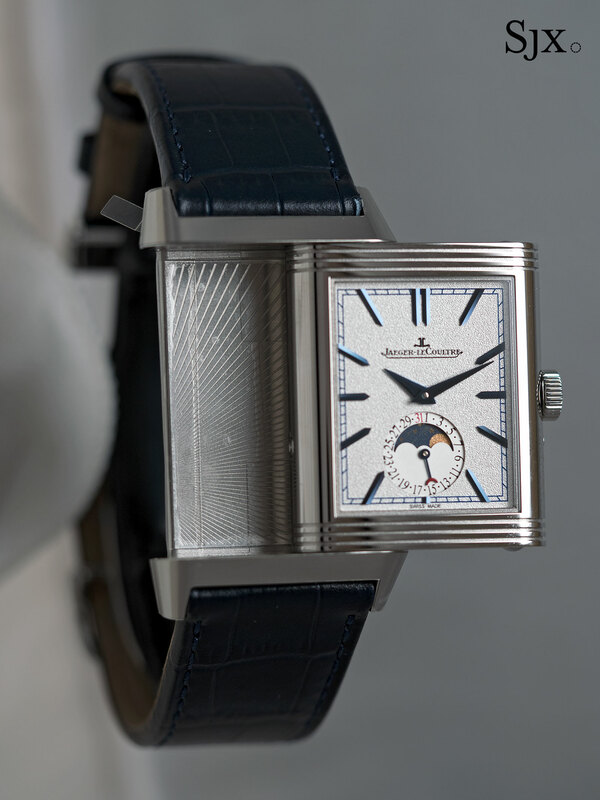 The first is the hand-wound Reverso Tribute Duoface (ref. 3902420) in pink gold that can show two different time zones on each face of the watch, thanks to the clever calibre 854A/2 inside. This is a compact 25.5mm wide and 42.9mm long, about the size of the Reverso Grande Taille. It costs €20,000 or S$29,500. 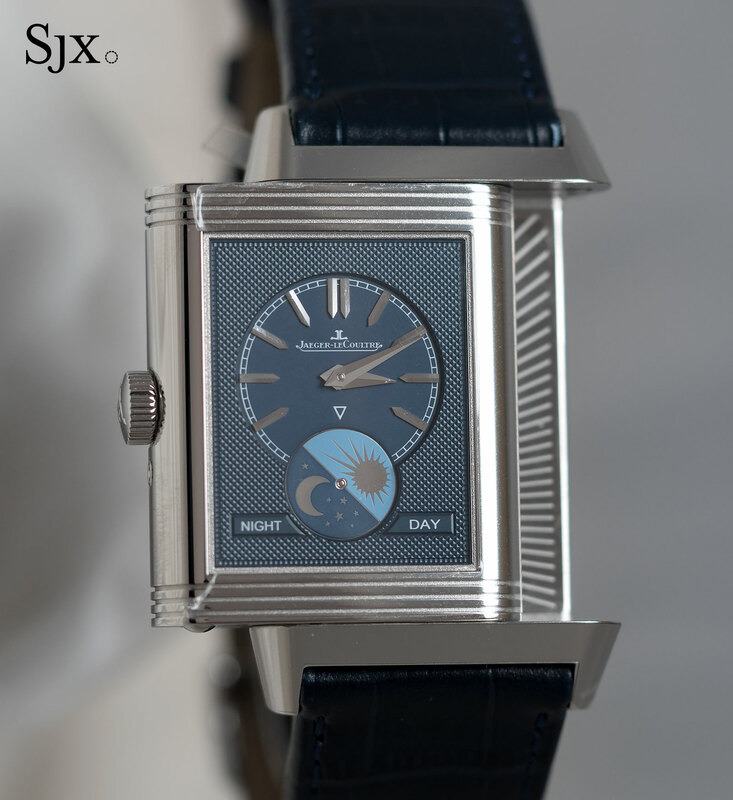 The Reverso Tribute Moon in stainless steel (ref. 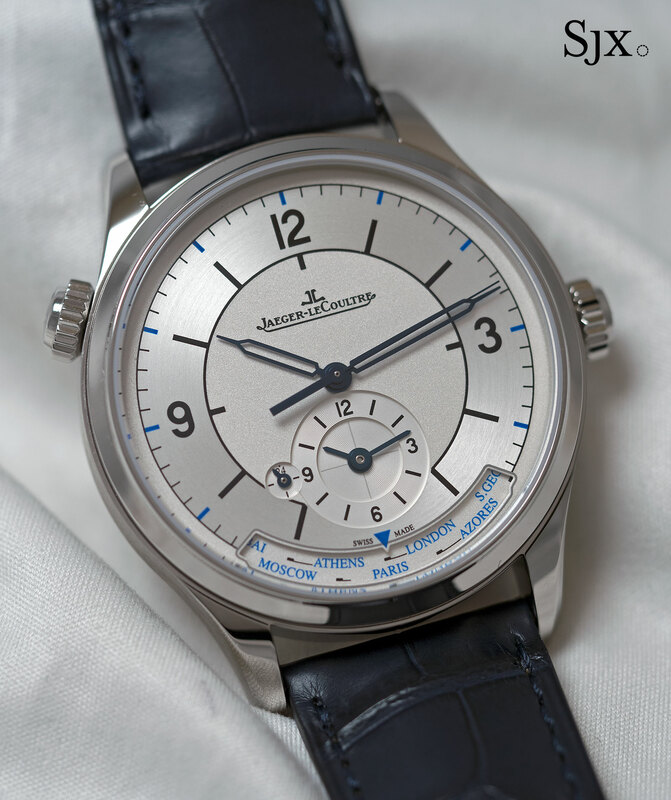 3958420) is similar, with two time zones and the addition of a date and moon phase display on the front dial. Larger at 29.9mm wide and 49.4mm long, it’s hand-wound and powered by the calibre 853A. It costs €13,200 or S$19,500.